Pain, blurred vision, and even loss of sight might result in particularly severe cases. Tears lubricate the inside of the eyelids to make blinking smooth and comfortable. Without them, the surface of the eye can become irritated, which can potentially cause damage to the cornea. 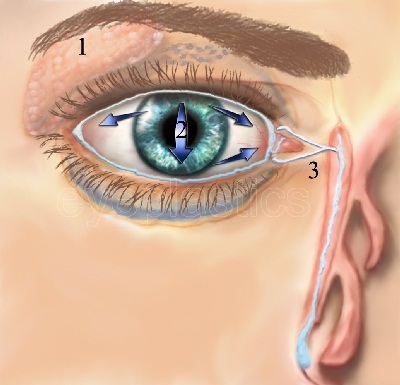 Tears are produced in the lacrimal gland (1) and lubricate across the eye (2) and are then drained through the punta, canalicular drain into the lacrimal duct (3). What Are the Purposes of Tears? Tears moisturize the surface of the eye. Tears lubricate the inside of the eyelids to make blinking smooth and comfortable. Without them, the surface of the eye can become irritated, which can potentially cause damage to the cornea. This prevents the cornea (the transparent front portion of the eye that covers the iris, pupil, and anterior chamber) from drying. 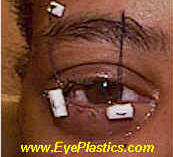 If the cornea dries, it can potentially become damaged. Tears nourish the eye by transporting oxygen to the eye and removing carbon dioxide. Without tears, a malnourished cornea can lead to damaged vision. Tears clean and protect the eye by washing away foreign particles. Tears contain antibacterial and antiviral substances that help defend the eye against infection. How Are Dry Eye Symptoms Treated? If you suspect you have dry eye symptoms, see your doctor. He or she can determine which treatment is appropriate for you. Depending on the severity of your condition, tear replacement is the most commonly recommended therapy—this involves the use of lubricant eye drops. The primary goal of treatment is to keep the eye moist and comfortable and to protect the eye’s delicate surface. In adds to to making changes to your environment, you might want to also use artificial tears to ease your symptoms. You should also try to eliminate the factors that exacerbate or contribute to dry eye: Contributing eye abnormalities (such as blepharitis, an inflammation of the eyelids) should be treated. Schedule regular breaks from reading, television viewing, and computer use. Try to avoid excessive heat, air conditioning, and low humidity — they can aggravate dry eye symptoms as can being close to air conditioning ducts or heating vents. Lower your computer screen so that you are looking down at it. This might decrease some of the discomfort that is often associated with prolonged computer use. Avoid or eliminate those elements that are known to cause or aggravate dry eye symptoms. The use of antihistamines or diuretics should be decreased as much as possible. However, it is important that you talk to your doctor before adjusting the dosage of or stopping any medications. Artificial tears are a common treatment for dry eye symptoms. They provide moisture, surface wetting, and comfort for people who suffer from dry eye symptoms. Preserved artificial tears are typically recommended for those with mild dry eye symptoms. As your symptoms become worse, you might increase the use of artificial tears. Preservative-free tears are often recommended for those with moderate or severe dry eye symptoms. People with sensitive eyes might also prefer nonpreserved tears. Thicker artificial tears or ointments might be substituted if you use artificial tears more commonly. Omega-3s are essential fatty acids. “Essential” means that, because they cannot be produced by the body, their inclusion in the diet is essential for good health. The two best sources of omega-3s are dark, oily, cold-water fish, and flaxseed. They are known to have a multitude of health benefits, yet, as a population, Americans are omega-3 deficient—it has been estimated that 83% of Americans are deficient in omega-3s.1,2 North Americans have among the lowest dietary intake of omega-3s in the world (Figure 1). Omega-6s are another group of essential fatty acids. Americans obtain an excess of these through their consumption of beef, dairy, vegetable cooking oils, and vegetable shortenings (i.e. cookies, potato chips, snacks etc.). Unfortunately, while the recommended ratio of omega-3s to omega-6s is 1:2.3, the existing ratio of omega-3s to omega-6s consumption has been estimated to be as low as 1:10. There is an abundance of clinical evidence that ingestion of omega-3s decreases the inflammation seen in the joints in rheumatoid arthritis 3-6 and in the skin in dermatitis as well. 7These anti-inflammatory effects go a long way to explain why omega-3s have been useful in helping patients with symptoms of posterior blepharitis or meibomitis. 8 In my practice, omega-3s have been displacing my use of systemic tetracyclines as treatment for the eye irritation that my meibomitis patients experience upon awakening in the morning. But the effects of omega-3s only begin with their effects on meibomitis. The effects of suppressing pro-inflammatory cytokines don't stop here. We now know that the pro-inflammatory cytokines TNF- a , IL-1 a , and IL-1 b , impair tear secretion in lacrimal gland disease-based dry eye by inhibiting the release of neurotransmitters from neural synapses, and interfering with the secretory response of lacrimal gland acinar cells to stimulation. 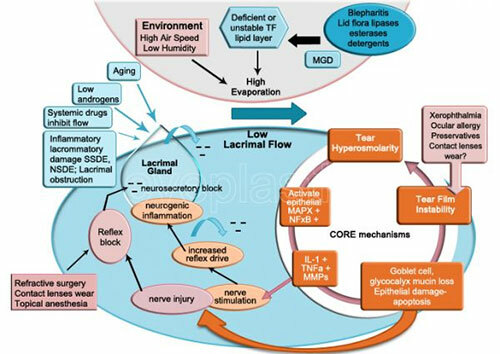 This is probably the main mechanism by which tear secretion decreases in dry eye. Meibomian glands use essential fatty acids to synthesize oil (meibum). Dietary intake of omega-3s in general, and EPA and DHA in particular, have recently been shown to affect the polar lipid profiles of meibum as observed by HPLC. 25 Indeed, Boerner has observed the clearing and thinning of meibomian gland secretions with omega-3 supplementation. 8 Further studies are needed to determine whether these effects are sufficient to bolster the oil layer and retard evaporation. Restasis ® Ophthalmic Emulsion is the only prescription eye drop indicated to increase tear production which might be reduced by inflammation on the eye surface in patients with Chronic Dry Eye. Unlike artificial tears, Restasis® Ophthalmic Emulsion helps increase your natural ability to produce tears which might be suppressed by inflammation due to Chronic Dry Eye. Indeed, various patients using Restasis® report a noticeable increase in tear production with continued use. Restasis® Ophthalmic Emulsion works gradually to increase tear production. Individual results might vary. You might originally notice you're using artificial tears less and less. Over the course of time, you might be able to discontinue their use altogether. By the end of the third month various users can experience a significant difference in tear production. As shown in six-month clinical studies, the benefits of Restasis® Ophthalmic Emulsion depend upon continuous use of the product.